How to play the latest version of Mecha'thun Rogue in the new Rastakhan meta. Our Mecha'thun Rogue deck list guide features the best Rastakhan deck list for Season 57 of Hearthstone (December 2018). Our Mecha'thun Rogue guide will also be updated with Mulligan advice, card combos and strategy tips. Mecha'thun Rogue is a Hearthstone deck archetype that uses the hero's unique collection of tools to achieve a victory with the titular card. 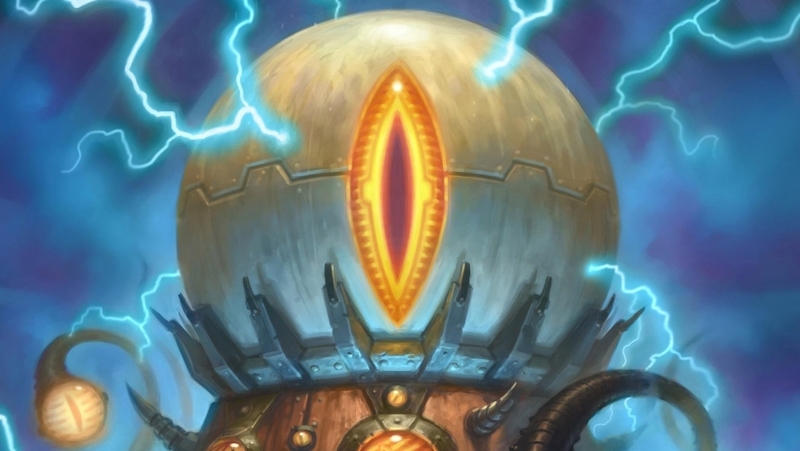 For the uninitiated, destroying Mecha'thun while there are no other minions on the board - and no cards in your deck or hand either - will cause your opponent to be instantly obliterated. A few hero's managed to find success with this fun playstyle, but the Rogue's version failed to take off. With the introduction of Walk the Plank in the new Rastakhan's Rumble set, however, it's likely the Rogue will have one of the fastest ways in the game to achieve this unique win-condition. We'll have a Rastakhan deck list for you when the new expansion arrives, but for now we wanted to highlight a version of the deck you can start practicing with right now. We've got a deck list for you to work with, as well as an overview of the core synergies available in it. We’ll be overhauling our deck guides comprehensively over time, but we wanted to bring you an update for Mecha'thun Rogue that you can start playing with at launch. When we know the shape of the meta we’ll be completely overhauling all of our deck guides to reflect the settled deck list. Until then, all the content in this article should be considered general advice that refers to a previous version of the deck. As we've already mentioned, Mecha'thun Rogue has not seen a lot of play in The Boomsday Project, but this seems to be the best version of the deck you can experiment with right now. We'll add in a Rastakhan list once all the cards have been revealed and we can do some proper theorycrafting. Have the following cards in-hand: 2 x Galvanizer, 1 x Mecha'thun, 1 x Backstab, 2 x Eviscerate, 1 x Preparation. Play Hemet, Jungle Hunter to thin out any low-cost cards in your deck. Cast Myra's Unstable Element to pull all remaining cards into your hand. Play both Galvanizers to reduce the cost of your Mecha'thun to eight Mana. When you only have the cards in the first step left in your hand, play Mecha'thun, Backstab it (2 damage), Eviscerate it (6 damage), then use Prepation and your second Eviscerate (10 dmg). - All spells gain an extra point of strength when Bloodmage Thalnos is out on the board. He'll also draw you a card when destroyed by the opponent. - Eviscerate is a core part of your win-condition, and neither copy should be used for any other purpose. - Likewise, the Galvanizer minions should only be played when you have Mecha'thun in your hand. It's the only Mech in the deck, and so is the core target for the Mana-reduction effect. - Cards like Loot Hoarder, Novice Engineer and Acolyte of Pain are good for contesting the early board and drawing into more of your deck. Note that you can use Shiv or your spare Backstab to target the Acolyte of Pain and get more cards flowing. - When played, Hemet, Jungle Hunter will destroy all cards in your deck pile that cost three Mana or less. Make sure you've got all your core combo pieces in hand before putting this guy out into play!